Home»All»Where to have fun in Houston, without the Spring Break crowds! March 2014 Spring Break! Where to have fun in Houston, without the Spring Break crowds! March 2014 Spring Break! Yesterday we made the mistake of driving into the museum district… with every other family in Houston. We quickly turned the car around and set out to find things to do, over Spring Break, without all the crowds! Downtown should be less crowded than the Museum District and Reliant, but Discovery Green has a full schedule for the week of March 17. I still suggest taking METRORail and jumping off at Main Street Station. Tickets can be purchased at any station. Go to the self-serve station and use cash or credit card. METRORail is on the “honor system”, so just hold onto your ticket and show it if the METRORail police ask to see it. 2. Take advantage of “Weekday Attractions”! Spring Break is during the work week, so you have a great opportunity to visit venues that are closed on weekends! This includes the free JP Morgan Chase tower observation deck and the miles of tunnels under the city! Go here for the full list of things to do Downtown with kids! 3. Visit Houston’s parks! There are so many parks in our city that you are sure to find one without a crowd. Go here for over 40 reviews of local parks! If it’s warm enough for swimsuits, look here for all the free splashpads around the city! 4. Enjoy the bayou trail! There is a lot to see along the bayou trail. 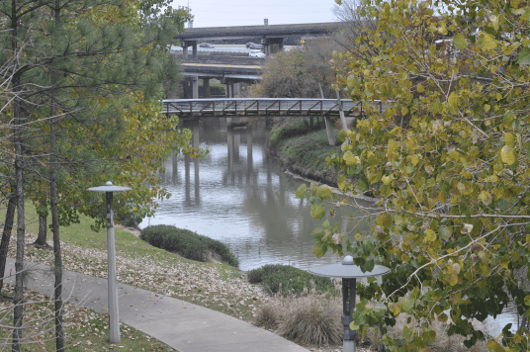 Enjoy a walk or bike ride along the water with ducks, bridges, art and great views. At dusk, stop by the Waugh Bridge Bat Colony to see hundreds of thousands of bats emerge for the evening! 5. See a show! Head to Main Street Theater to see A Year with Frog and Toad! Buy your ticket ahead of time and you’ll be assured a seat, and no crowd fighting! 6. Run the bases at Rice! On March 23, come with me to watch the Owls take on Florida Atlantic. Before the game, kids can go on the field, with the players, for the National Anthem. After the game, they get to run the bases! And, tickets are only $8 with the promo code! 7. Burp the Bayou! I know, I know. I say it all the time. Our favorite thing to do in Houston is push the mysterious red button on the Preston Street Bridge! There will be no lines or crowds here, so go do it over Spring Break! Afterwards, stop by Market Square Park and grab lunch at Niko Nikos! Looking for more? Check this list of Free Things to do in Houston, any day of the week! The full list of things to do in Houston for Spring Break can be found here for the week of March 8 and here for the week of March 15. Let the kids run the bases at the Rice baseball game! Tickets are only $8 with BKSC Promo Code!